You are looking at the very first work shop taking place in Boon’s new place. The lighting is great. The space is larger. It is still a bit new looking, but great bonsai and teaching will be taking place here. That is a given. Intensive students who, in a week, will be winging their way across North America have something to look forward to. This is definitely a “step up”. You will only miss one thing. Jai no longer lies right in front of the entrance. He tends to stay closer to Boon. But you’ll get used to it. This entry was posted in B.I.B. 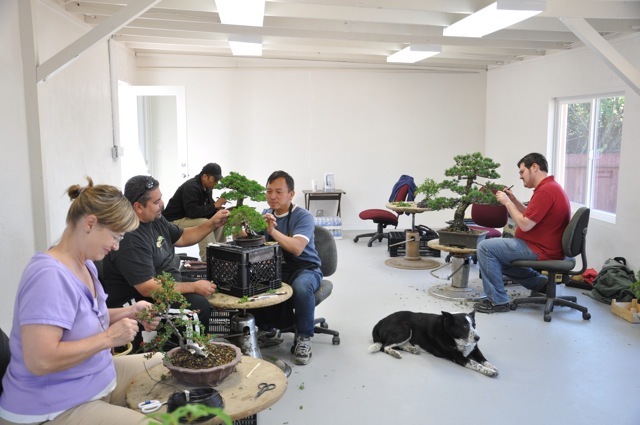 News, Bonsai News, Boon News. Bookmark the permalink.